No matter how the rest of the Ottawa Senators series plays out vs. the New York Rangers the time is right for the hockey world to both recognize and thank the Senators for what has been one of their most amazing seasons. Let’s begin with the most telling statement of what was expected from the Ottawa Senators by hockey experts in their 2011-2012 pre-season rankings: “Ottawa has a great young blue line in the making, but there are way too many holes and question marks for the Senators to be anything but a lottery team this season.” The second week of the season brought a similar theme “No one is hiding it in Canada’s capital: This is a rebuilding season for the Senators.” By the third week of the season we all started to realize that this was simply not the case for this team “Say this about the struggling Senators — they’re in every game.” In the middle of the season the Senators were still in a playoff position and playing strong. By the end of this season it was obvious that Ottawa was the biggest surprise in the NHL this year. But again they had to prove that they weren’t content just to make the playoffs but that they belonged to be there and were still hungry to prove more. Let’s be honest opening the playoffs against the New York Rangers rather than the Boston Bruins was a much better matchup for the Senators. It was fine by me for the Bruins and Capitals to beat the crap out of each other. But the Senators still had to go out and play a team that just missed winning the President’s Trophy for the league’s best record and who also boasted the league’s best goalie. The first game against the Rangers was many of the Senators player’s first taste of NHL Playoff experience and they looked that way losing 4-2 in game that wasn’t as close as the score indicated. Game two was a must win for the Senators just as much as it was a must respond from a team toughness standpoint. Matt Carkner ensured the Rangers realized they couldn’t push the Sens around and Nick Foligno and Chris Neil proved they had the experience and willingness to pay the price to help the Senators to a late game tying goal and the winner in overtime. All of this happened after the Rangers knocked Daniel Alfredsson out of the game and possibly the series with a viscous elbow from Carl Hagelin. Game three was the goalie show for both Craig Andersson and Henrik Lundquist and the Rangers goalie out-dueled his Senators counterpart plain and simple but the Senators continued to play their game. 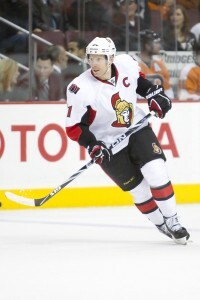 Game four once again became a must win for the Senators not wanting to head back to New York down three games to one. Two quick penalties and two quick power play goals had the Rangers leading 2-0 at the end of the first period. Then another test began for the team that was willing to respond all season (evident by their 12 come from behind wins during the regular season). Two goals in the second period by Milan Michalek and Sergei Gonchar who had been held off of the score sheet up to this point in the series and an amazing third period that saw both teams trade excellent chances and there they were in overtime again where Kyle Turris shot the perfect shot that wasn’t blocked by a Ranger, that the goalie picked up just as it sailed over his left shoulder into the top corner of the goal that sent the Corel Centre into bedlam and rewarded the fans responded who provided the Senators with energy all game long. Over the course of this series terms like “they were all over them, they needed an hero and got one again” have been used to describe this very same team that was destined to be a basement dweller at the beginning of this season. No matter how the rest of this series plays out, regardless of who wins the Ottawa Senators of 2011-2012 have proven their critics wrong, rewarded their fans with exciting playoff hockey and proven to each other that they are right where they belong.